You’ve fought hard to drive visitors to your website. Encouraging them in every way possible to make a purchase or at least sign up for your newsletter. But what do you do about those people who stop engaging with your business? What do you do about those who never signed up for your newsletter and haven’t returned to your website to make that purchase? Simple. You re-engage them with website push notifications. In this article we are going to cover 5 powerful ways you can use website push notifications to drive visitors back to your site and ultimately boost sales. Tip: New to website push notifications? Check out our 1 minute explainer video or read our Beginner’s Guide. Over the past few years the term “actionable insights” has gathered a fair amount of attention. While the term may sound impressive – actionable insights simply means that the information you are gathering on your website can be directly used in your marketing or advertising efforts. One of the beauties of some web push notification platforms – such as Aimtell – is that it automatically tracks visitor activity for you. This not only includes geo-location and visit date, but also includes things such as page views and items purchased. And all of these “insights” can be sliced and diced to help you create a more specific target for your next push. So when preparing your next web push notification, consider breaking down your target segment into a couple more narrow niches and sending specific promotions. For instance, you could create a segment of all users who purchased a certain product of yours and send them a notification to buy a similar product. You can easily create a segment of users who have purchased a specific product. If you haven’t had many users purchase a specific product, instead of targeting previous customers, you could segment all visitors who visited a specific page, say “yoursite.com/timetravel,” and send them the notification. An example web push notification alerting users of a best selling product that has gone on sale. Think of your favorite ecommerce website that you shop from. When are you most likely to head back to their website and make a purchase? If you are like the majority of online shoppers, it is because you can get items for a great price. In fact, 80% of shoppers say that price is somewhat or very important when deciding when to shop. Hosting a sale is a great way to boost your ecommerce sales and drive visitors back to your site. There’s just one problem- people need to know the sale exists! Easily solve that problem by sending users a web push notification. Utilizing web push, as compared to other platforms such as email or social media, tends to give brands better results because of the increased visibility and real-time delivery. No more hoping that a user opens your email or that they happen to scroll past your social media post. The result? More awareness and more sales. In fact, sale notifications is one of the main tactics that Rhone Apparel used to boost their ecommerce sales by $93,000. An example web push notification alerting users of a short term sale. A web push campaign is especially important if you run a short term or flash sale where timing is a major component. Also consider setting a custom notification expiration time so that people don’t see your notification once your sale has already ended. Another excellent method of using push notifications to drive back visitors to your website is by combining those actionable insights with the power of automation. As an example, you could create a push notification campaign that is scheduled to run once a week that targets anyone who has not been to your website in more than 10 days. If the individual receives the notification and clicks it, they are automatically removed from that segment since they’ve visited your website in less than 10 days. If the individual ignores your notification, they will receive it again next time your automated campaign runs. Here is an example of a segment of users who have not visited this specific page in 10 days. It might be a hard stat to swallow, but it’s the reality – abandoned carts are going to happen. Fortunately, there are several ecommerce platforms (like Shopify’s premium versions) that allow you to automatically send emails to re-engage customers who filled out their contact information but did not complete the order. But what if you don’t have the premium version? Or what if the visitor abandoned the cart before they even filled out their contact information? Fortunately, website push notifications can come to the rescue. With event based notifications you can create custom campaigns to send notifications to any individual who has subscribed to your website, began the checkout process, but then left your website. You can then have a notification automatically go out to this individual after X amount of time, perhaps with a promo or discount, driving them back to your site. 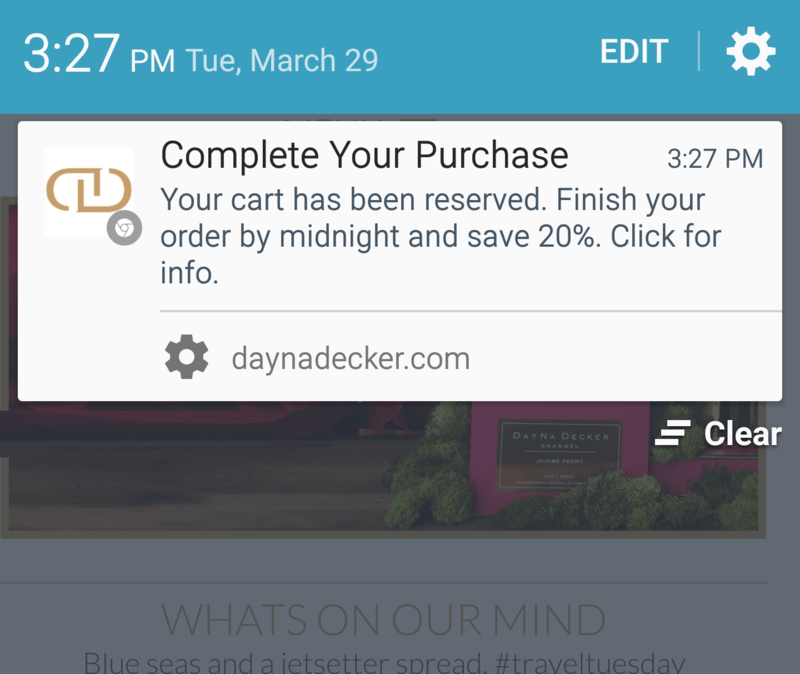 An example of a web push notification delivered to a mobile device retargeting a user who abandoned their cart. While understandably a more indirect method of boosting sales, shipment notifications are another fantastic way to not only increase site traffic, but also to increase overall customer experience. Why haven’t we seen this more often you might ask? Simply put, prior to website push notifications, the only companies that were able to send shipment push notifications were those that had a mobile app. Therefore the only companies that would do this were large retailers such as Amazon. 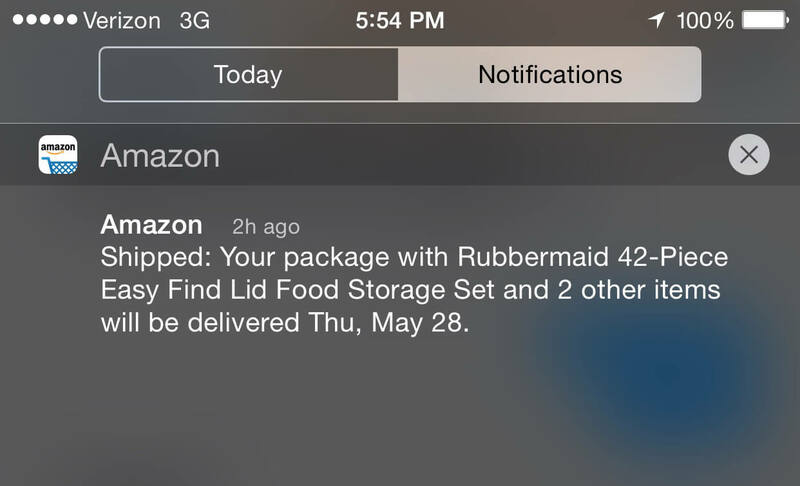 An example of a shipment notification from Amazon. However, with the birth of website push notifications – these type of notifications can now be integrated into any website without too much effort! No mobile app required. And with Aimtell’s extended integrations – this is often all completely ready from the start. All you need to do is tweak the message you want and hit activate. It is incredibly easy to set up a triggered notification alerting a user that their item has shipped. So there you have it! Five great ways to use website push notifications to drive back visitors and boost sales. Understandably, some of these techniques may seem a bit advanced if you aren’t familiar with website push notifications yet, but don’t have that frighten you. Web push notifications are a fantastic way to retarget your audience and boost ecommerce sales. If you want to get started, sign up for our 14 day free trial and see for yourself the power of web push! As always, if you have any questions feel free to send us a message. Tags: digital marketing, ecommerce, sales, web push notifications.